Hey guys, I'm in Holland! I haven’t took any photos yet because, well, I got in last night. But don’t worry, I'll show you so many pictures, you'll ask me to stop. Today we’ll drive north, to Frisland, where we’ll visit my sister’s in-laws for a couple of days. She said it’s worth going because it’s a beautiful place rich with natural beauty. Old windmills, typical farmhouses, a vast system of canals and waterways, woods, dunes, marshes, and acres and acres and acres of crop fields and pastures. Frisland is also home to the frisland cattle, a black and white sturdy and stocky cattle. The cattles graze on fresh green pastures daily during the growing season and are given hay in the winter months. That’s it, no junk. It doesn’t get more grass-fed, pastured, organic, GMO-free, antibiotic-free, hormone-free, than that. Amazing dairy products, juicy meat. Yum! Driving from Amsterdam to Frisland takes about 2 hours. Along the way, we’ll stop for a quick road side picnic. So this morning - while still jet-lagged - I made this amazing frittata with grated zucchini, goat cheese and dill. I used to think frittatas were a utilitarian way to use up expiring ingredients; a dish that got the job done, but didn’t inspire much excitement. My tune changed when I started making REAL frittatas. A good frittata, such as this one, is luscious and creamy and full of flavors that span the spectrum from rich to fresh. In this frittata goat cheese adds creaminess and rich flavor to the delicate zucchini, while the dill brings a summer-fresh flavor boost. 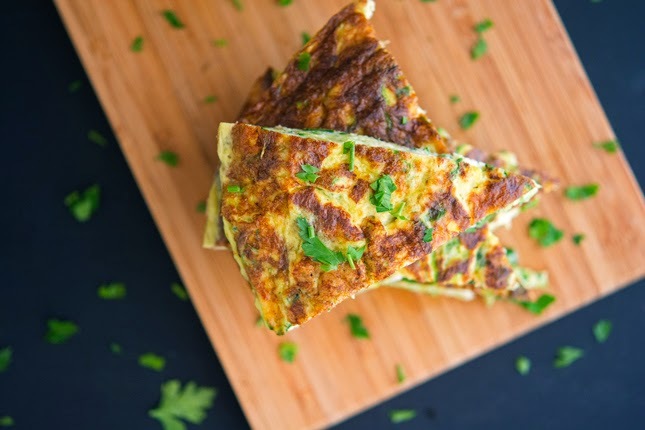 Frittata can be eaten either hot or cold. Cut into thin wedges for an excellent appetizer, a great picnic food, and is perfect for light meals, say with a tossed salad. I may have started out my life thinking frittatas were no more than a vehicle for emptying out the fridge. But I’ve learned, and now I know there’s nothing better to pack for a picnic. 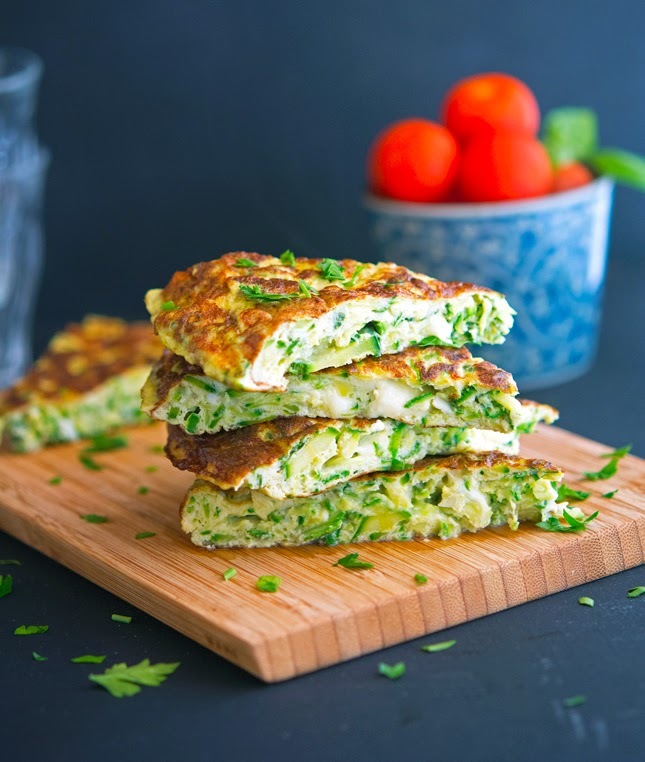 Frittata with Grated Zucchini, Goat Cheese and Dill Print this recipe! Heat one tablespoon of olive oil in a large skillet (preferably nonstick) over medium-high heat. Add grated zucchini and cook, stirring every so often, until the zucchini begin to wilt, about 2 minutes. Stir in garlic and cook for another minute, until fragrant. Season with salt and pepper and remove from the heat. Set aside. In a large bowl beat the eggs with the crumbled goat cheese. Add zucchini and stir to combine. Clean and dry the skillet and return it to the burner. Heat the remaining tablespoon of olive oil over medium-low heat. Pour in the zucchini egg mixture and tilt the pan to distribute the mixture over the surface. Shake the pan gently, tilting it slightly with one hand while lifting up the edges of the frittata with a spatula in your other hand, to let eggs run underneath. Turn down the heat to low, cover and cook for 10 minutes. From time to time, remove the lid, and loose the bottom of the frittata with a wooden spatula. The bottom should have a golden color and the eggs should be just about to set (make sure it doesn’t burn). In the meantime, heat the broiler. Uncover the pan and place under the broiler, not too close to the heat, for about 1 to 3 minutes, watching carefully to make sure the top doesn’t burn. Remove from the heat, and shake the pan to make sure the frittata isn’t sticking. Allow it to cool for 10 minutes. Loosen the edges with a spatula. Carefully slide from the pan onto a large round platter. Cut into wedges or into smaller bite-size diamonds. Serve hot, warm, at room temperature or cold. One serving yields 192 calories; 7 grams of fat, 3 grams of carbs and 12 grams of protein. This looks amazing. Have a great time in Holland! Mike, your jet-lagged frittata cooking skills are GREAT - love the zucchs in there - my frittas -cooked while I am wide awake- never come out looking this good! Holy cow, Mike...I'm amazed by your cooking and photography skills after that flight over! Another reason I am in constant awe of the deliciousness on TIY! Oh, and I can't wait to see pics. I am beyond jealous that you are over in Holland right now. Enjoy it, man! You have all the reasons to be jealous because I'm having the greatest time ever. But I promise to drink one of those amazing dutch beers in your honor! This looks delicious! I am pinning this for later use. I can't wait to see pictures of your trip, and I'm a little jealous of the the great cheeses you're going to be around! 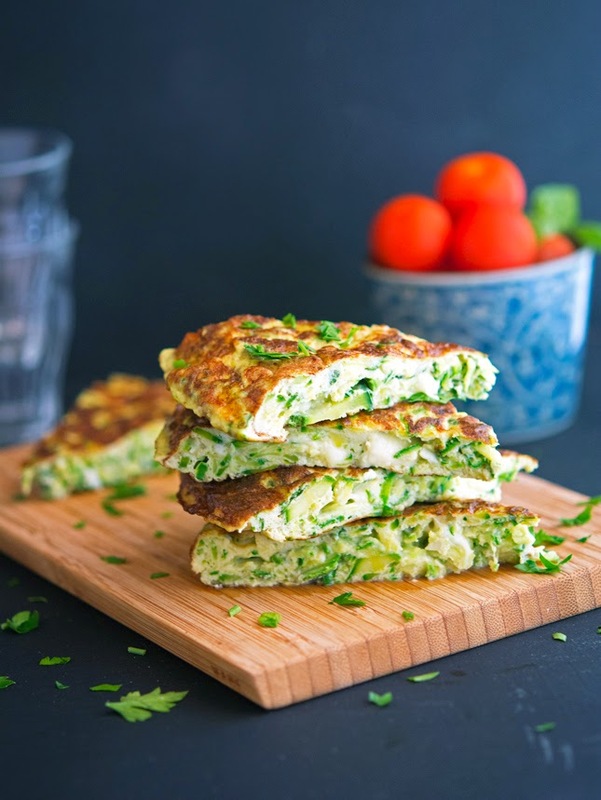 Thanks for the reminder that frittatas don't have to be boring, this one looks truly delicious! The cheeses are so great Kari. Yesterday I tasted a super-aged gouda and it was to die for. Solid stuff! 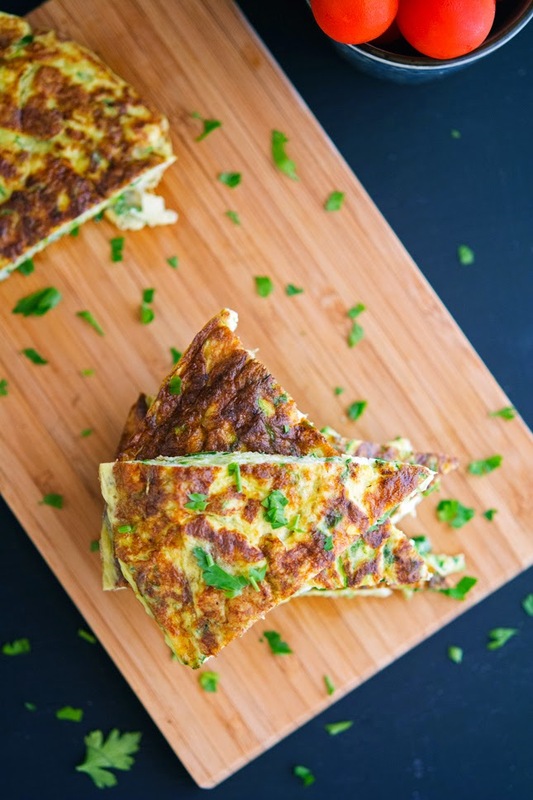 This frittata is just what I need to spice up my boring morning breakfast routine of eggs and toast!! P.S We all need to see tons of pics of Holland! What?!? Jealous! Hope you have a blast, can't wait to see the pics. Only you would be able to cook an amazing frittata while jet lagged! YUM!! Awww Lauren, you're super sweet! Mike, my man! Love to see that you're visiting Holland-- I actually lived there for around 7 years myself. This frittata looks awesome. Make sure to whip up a recipe or two using the great Dutch cheese (yum). In the meantime, we can make a dent in the neverending zucchini with this deliciousness. 7 years? That's so awesome. I wouldn't mind living here for a couple of years as well. It's such an amazing country and it's right in the center Europe. You can hop on a train an go to Paris, Berlin or London in just a couple of hours. AMAZING. I'll eventually go to the Van Gogh museum, although I prefer contemporary and modern art. In fact, this afternoon I'm going to Stedelijk Museum, which is awesome! HI Mike, Holland, how cool is that, and you even made a frittata and had time to post you are amazing! Have fun in Holland and pleeeease post A LOT of pictures! I will Jennifer, I promise! I can imagine how this tastes and I want it! I love how you got some much veggies in here and just enough cheese to make it fun to eat! That's exactly it Sophia, I couldn't have said it better! You just need a little bit of practice, it's really all it takes! Oh HECK YEAH to this sandwich. This looks delicious and the flavors sound yummy and simple! I will have to give this a try while I have tons dill growing in my garden! If do you, let me know how you liked it! You know that EMOJI on your iPhone (if you have one) where the face has its tongue out like a dog... Yeah, that's me right now! Lucky you! I hope you enjoy your time in Holland!